Recipe: Broccoli Cheese Soup — Two Ways! 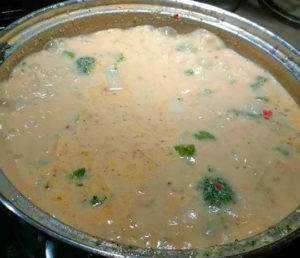 Living in Wisconsin, broccoli cheese soup is a dietary staple. Most people have their own signature recipe, and often we covet one another’s deliciously cheesy variation. A member of our Culinarie Cooks Facebook Group posted his Broccoli Cheese Soup with our exclusive Helldust seasoning (part of the March box). Coincidentally it was just as I was starting a batch of Curried Broccoli Cheese Soup. It was a good ol’ fashioned Wisconsin broccoli cheese soup-off! Here are both of our recipes. Which one would you try first? Throw water, boullion, onion in pot, boil the @!#* out of it, add other stuff, keep boiling and stirring for 10-15 min so that $! @# don’t boil over, reduce to simmer, add cooked chorizo, blend with immersion blender. Psst…. Bawss Sawss might be one of our guest chefs soon, so if you like this recipe, keep an eye out! You can follow his hilarious food reviews on Twitter or Facebook. Sauté carrots and onions in butter. Add flour, whisk to make a roux. Gradually pour in stock (best if it’s warmed up) and mix thoroughly. Add potatoes and seasoning, bring to a boil. 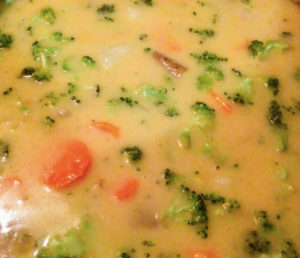 Once potatoes are softened and soup is thickened, drop in the broccoli and the cream (or half and half). Cook for another 5 minutes.